Today is going to be fun for many schleps on Capitol Hill — some grimacing because of stuff President Obama said, others delighting for the same words. You can’t make any of those nine-percent-approval-rating hacks happy. 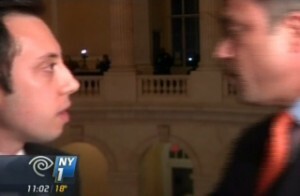 Grimm skipped the ‘State of the Union’ afterglow and gave himself a big PR black eye. In one of the bajillion post-SOTU interviews, NY1 reporter Mike Scotto managed to get Grimm’s attention for an interview in the Capitol Rotunda. His follow-up question perturbed Grimm so much that he threatened to hurl Scotto clean off the balcony. And yes, he did it on live TV. Shake hands. Kiss babies. Threaten murder. Right out of the ‘running for office’ handbook. Good on ya’, Grimm. So, why not turn that frown upside down (and possibly get the NYPD off your case for that homicidal threat)? According to the New York Daily News, Grimm may have some sticky fingers. There’s a two-year federal investigation of fundraising for Grimm’s 2010 campaign led to the arrest this month of a former girlfriend, Diana Durand. She was accused of using so-called straw donors so she could exceed the $4,800 maximum allowable contribution to his campaign. Stay classy, Rep. Grimm. We hear NY1 is hiring political experts. Maybe Scotto can put in a good word?